Performed and recorded on 27th June, 2009 at the Butterfly Walk Shopping Arcade, London SE5. “Edith Piaf and Enrico Caruso are examples of street singers who went on to bigger things. Whereas they had great voices, I’m unsure about the aesthetic quality of my own voice since I don’t (have to) hear it. For the ‘Fivepenny Opera’ I will sing – unaccompanied – as a feral busker in the small shopping arcade, ‘Butterfly Walk’ off Denmark Hill just south of Camberwell Green. My chosen style will be that of a warbling ‘colaratura’ opera singer, (pace Florence Foster Jenkins). Having the dubious capacity to render popular songs* in a bombastic, cod-operatic baritone, I will take requests from the public and attempt to convert their favourite songs into this dramatic style. This bitter pill will be sweetened. Instead of requesting financial contributions from the credit-crunched public, I shall dip into my bowl to distribute silver 5p pieces to anyone who pauses before me: to pay them to listen if you like. 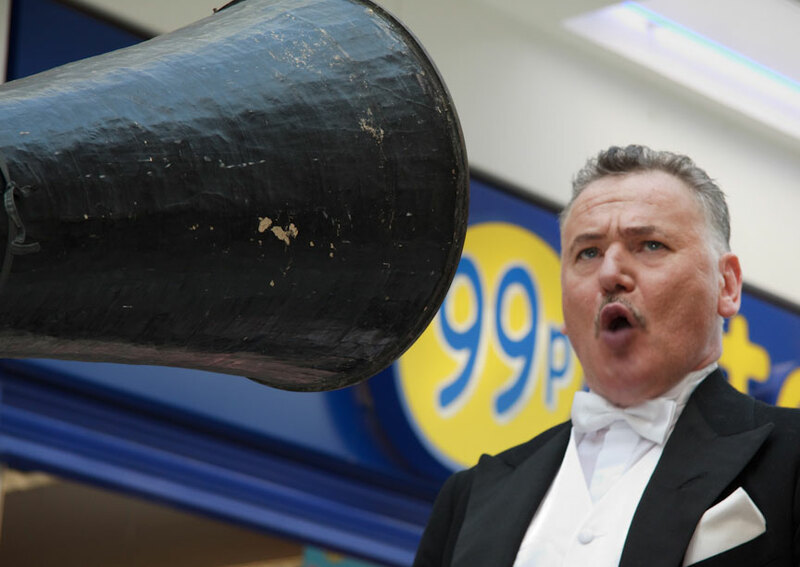 At 3pm, Aleksander Kolkowski of ‘Recording Angels’ will swoop into the arcade to make a wax-cylinder recording on an antique 1909 machine, the likes of which was used to record Enrico Caruso. . .
One of two cylinders made during Aaron’s performance for the Camberwell Arts Festival, the other being his interpretation of “Yellow Submarine”. Both were played back to the assembled crowd. I used an original phonograph studio recording horn c. 1905 and almost 6.5 foot long. The painted black horn is made from thick layers of papier mache in order to cancel out any resonant frequencies that might interfere with the recording. Very faintly in the background, you can hear that the horn has captured ambient noises from the shopping arcade including sounds from passersby, children’s voices and applause after the song.